You may have met these people. They sit in the stands at sporting events and tell the rest of the fans what they did or didn’t just see on the field. These clients know more about how your business back office should operate than the boss. These Know-It-Alls serve on committees and keep members deadlocked on decisions for days. 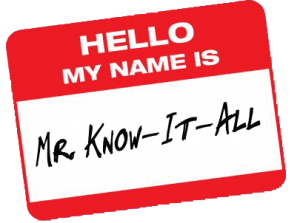 Know-It-Alls take on a tone of authority to let those around them understand that they have the final, absolute, full truth. Some Know-It-Alls convey their intelligence and discount yours by smiling condescendingly, shuffling papers, or changing the subject after you speak. Others are less subtle; they simply tell you in no uncertain terms that they know more than you do about the topic at hand. Sometimes Know-It-Alls really do know it all. Others pretend. Respect and use their knowledge. Despite the Know-It-All’s obnoxious communication style, his or her expertise can be beneficial. Use it to your advantage in solving a problem. Ask them to “argue the other side.” Sometimes you don’t know enough about a technical situation to pose alternatives. In that case, use the Know-It-All’s expertise to air other positions on an issue. Example: “Sara, would ALL attorneys agree with your conclusion — are there others ways to look at this situation?” Most likely, Sara will have to respond that not ALL attorneys will agree with her viewpoint. Then you have other viewpoints on the table for discussion. Use the broken-record technique. Simply repeat your position, decision, or plans in different ways. Although you won’t know it all when dealing with these less-than-pleasant people, these communication tips can make the interaction a little less stressful than hearing their lecture. This was originally published on Dianna Booher’s Booher Banter blog.